A bungee run is a temporary inflatable structure that can be hired or purchased for parties, functions and other special events. 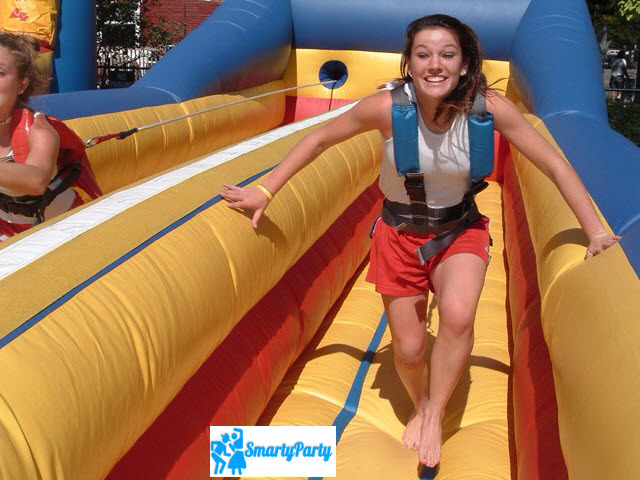 Of these inflatables, the bungee run is most likely among the top preferred inflatable game due to the level of enjoyment it brings to those who hire or use it. Add to that, it is also readily available in most party hire firms. The bungee run game rule is rather easy to follow and also and enables participant from all age levels, that is from children aged 8 , young adults to that of the not so young, to contend or verse with each other in a race. There are two lanes in each bungee run, each to be used by the game participant. All they do is to wear straps called the the bungee vests, grab a marker on one hand that is made of velcro then run towards a target at the end of the bungee run , stick the velcro marker anywhere on the sides of the inflatable bungee. The game participant who stick the velcro marker the fardest, wins the competition. To repeat that, just in case i didn’t express myself quite clearly the first time: You compete against another person in the next lane and try to go as far down the run as you can and attach a Velcro marker in the middle. The one who goes the furthest to the end wins. When the Bungee cord retracts it will slingshot you back to the start and if you jump when you cannot go any further down the run it will have you flying backwards to a safe landing on the inflatable bungee. It sounds easy as being described here but take note that you guys are strapped with an elastic harness that sort of makes the run rather challenging but also fun. People who attend these bungee run parties usually have the time of their lives exhilarate with so much fun on a bungee run and everyone witnessing the game will laugh so much they may even be incontinent or filled with gas. This a very competitive game and is fantastic for corporate events and team building. This is why it is an excellent inflatable for hire, ready little ones of all ages.